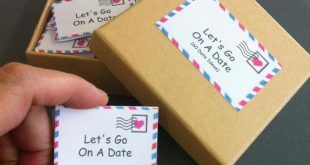 If you’re looking for some fun, yet practical and efficient, Christmas gifts don’t be shy and take a leap of faith with some interesting kitchen gadgets. We’re not talking about the plane, egg timers that help your loved one to have the perfectly boiled egg, but about the ones that didn’t even cross your mind type-like a carrot peeler and sharpener. The market is actually full of fun gadgets that make your life easier in the kitchen, helping you realize how your life used to be so complicated in the previous era. From the bagel slicer that holds tight your bagel so you get to cut it exactly in half, to the pancake pan that makes you become the pan magician in the kitchen, the options out there are various and fun to try. Banana slicers, condiment guns or melon slicers- the market is full of gadgets that aren’t essential when it comes to cooking, but it sure ease up your efforts in the kitchen. In addition, they all make it more fun to slice a banana or get the perfect slices for your melon. Who wouldn’t want that? Happy and all smiles, the Joie Silicone Devil Oven and Toaster Rack Puller, Red is a cheap little gadget that may be so helpful for many. The oven pull is red, matching perfectly the festive season and has a happy face, literally. It’s made of silicone and it’s heat resistant up to 536F degree. You may use it to safely pull hot bakeware and oven racks closer to you. It has a slim profile, which makes it easy to store. 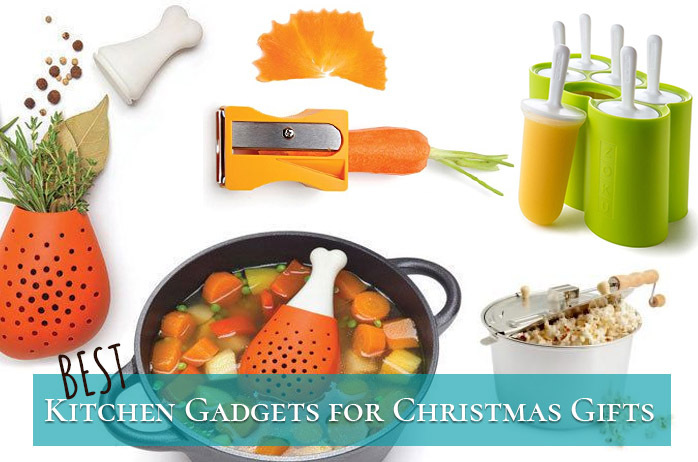 Fun, merry and functional, the little gadget is a keep for this year’s Christmas gift list. You may feel silly when buying it, but the moment you get to use it, you realize that this little gadget is far more useful than you had ever thought. The Dipr the Ultimate Cookie Spoon is the best utensil you could get when eating some cookies and dipping them in some milk. The Dipr is in fact a spoon that perfectly holds your sandwich cookie while you dip it in some warm milk or other liquid you like. The ingenious spoon is made in out USA and it’s food safe, meeting all FDA food contact standards. You don’t need to worry for your health as it’s BPA free, lead free and Phthalates free. You only have to worry about how many cookies you’ve been eating with the spoon. The Dipr is top rack dishwasher safe and it shouldn’t be used by kids under 13. Fun, easy to use and helping you to dip your favorite sandwich cookie in some cold milk, the Dipr is a great gift for many. 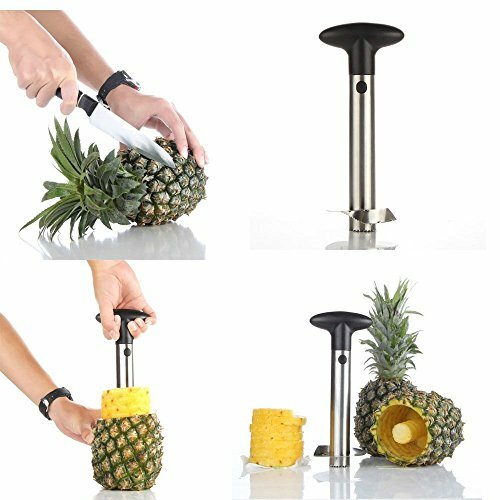 The Silver Stainless Steel Pineapple De-Corer Peeler Stem Remover Blades for Diced Fruit Rings is about slicing pineapple made easy and anyone is going to appreciate this amazing gadget this Christmas. The gadget peels, cores, and slices a whole pineapple in a couple of seconds. It’s made with a stainless steel blade that is medium-sized and long lasting. You don’t have to cut your pineapple entirely; you can also slice at a time. The best part is that you get perfectly shaped rings every single time. Additionally, the shell remains intact so you may use it as a bowl, for a sophisticated presentation. The gadget is easy to use and its simple design is effective. It has a good grip and you only have to turn and slice, getting perfect slices every time. It’s also easy to clean up the slicer. You only have to press a button so that the slicer separates from the knob, for easy farther cleaning. 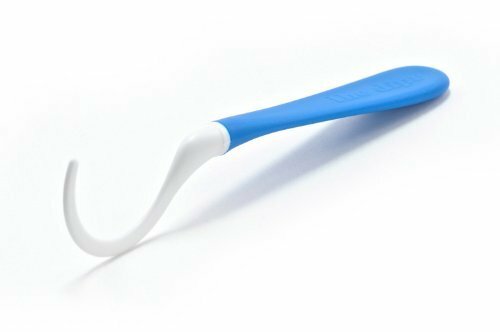 The blade is compact and you may easily store it when not in use. For all the veggie lovers out there, a useful and easy to use gadget is the Chef’n Zipstrip Herb Stripper. The gadget helps you strip and collect fresh herbs from the woody stems. It’s not complicated to use it and you only need to insert the stem into the hole, pulling the herb through, but starting with the root side. 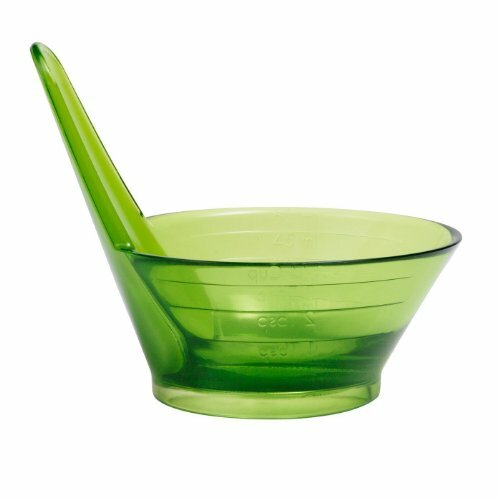 You continue by catching the stripped herbs in the built-in bowl, discarding the stem. The cup of the stripper is clear and marked so you don’t mess up the recipes: 1, 2, 3 tablespoon and ¼ cup measurements. 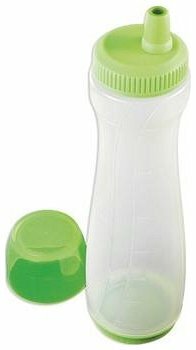 The herb stripper isn’t just easy to use, but also easy to clean on the top rack of your dishwasher. Don’t forget to add a safety note with “It’s very sharp” when wrapping the Vegetable Sharpener, Curler, Peeler, Ribbon Spiralizer. 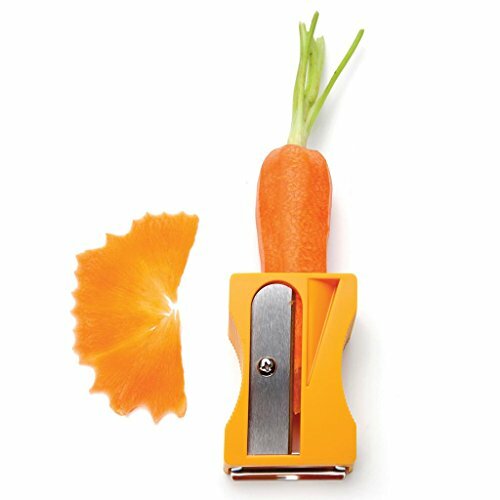 The little gadget is a peeler, a sharpener and a curler altogether and you may easily use it for zucchini, carrots, cucumbers and more. The sharpener is easy to use and it’s minimalist design is effective. It’s made with good quality materials and you may have your pick from various colors: yellow, green, red, and black. The sharpener is going to help anyone decorate faster and better the salads and dishes, if not for Christmas, maybe on New Year’s Eve. For all the bacon lovers out there, the Camerons Products Microwave Makin Bacon Cooker is going to make it as a great gift this Christmas. 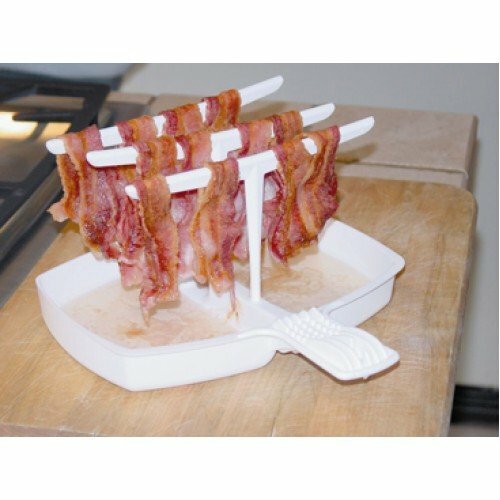 This little gadget helps you cook your bacon fast as it holds your bacon up in the air and needs only 1 minute per slice to do it. You only get to use it in your microwave, though. The bacon cooker is easy to use and you just hang the bacon over the bars and place a sheet of roller towel over the bacon, and get it into the microwave. The cooker lowers fat up to 35% and the convenient tray catches fat so your bacon slices are dry and not oily anymore. You may definitely use the fat in the tray later on for frying. Made in our USA with specially formulated high heat plastic, the bacon cooker isn’t just easy to use, but also easy to clean up. On top of everything else, it doesn’t give fat splashes into your microwave so everything is left behind nice and clean. 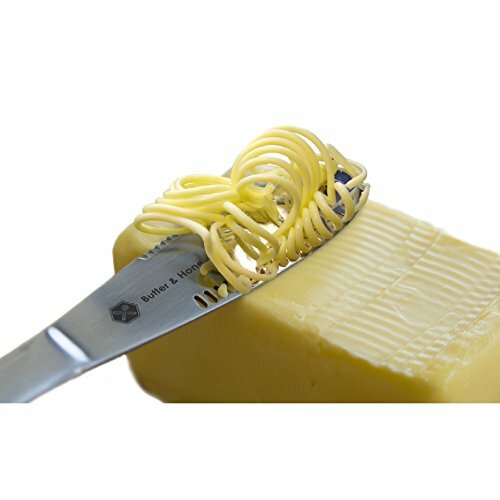 Even though it looks a bit weird, the Butter Knife 403 Stainless Steel Food Grade, Butter Spreader and Butter Curler is a great gadget that helps anyone enjoy their breakfast a lot better. The smart knife design helps it shred the hardest butter in fine thin “noodles”. The knife doesn’t tear bread when you lay the thin butter slices either and the butter is going to melt easier and faster. The built-in grater on the blade is the trick on the design and this is why the knife works so great. Once you layed the thin butter on your bread, you simply spread it with the ample blade, with no lumps and clumps of butter. The knife is easy to use and gives a good grip. It feel comfortable in your hands and even large hands get a good hold of it. The knife has a classic 403 Stainless Steel blade and it’s restaurant food grade and dishwasher safe. It doesn’t harbor contaminants or bacteria and you may safely dish wash it. Last, but not least, the knife looks elegant and makes a nice touch to any kitchen décor. 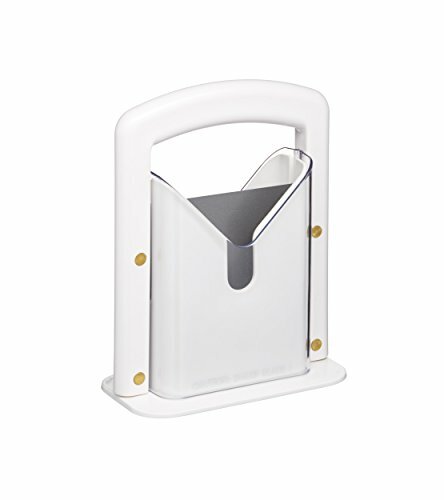 For those of you who like the perfectly sliced bagel, a very cute and reliable gadget is the Hoan Bagel Guillotine Slicer, White. Well-made and versatile, the bagel slicer is easy to use and you only have to place the bagel in the slot, pushing down on the blade afterwards. The cradle holds you bagel and two clear acrylic safety shileds make sure your fingers stay away from the patented piercing blade. You may also use the slicer for muffins, buns, rolls, not only for bagels. The sizes may be various as well. The precision ground serrated cutting edges, along the non-stick XYLAN coated blade make the slicing go smooth and the slicer to last for long time. Let’s not forget it’s also dishwasher safe, but top rack only. Pancakes are always a win with kids so don’t give any seconds thoughts about getting or not the Tovolo Pancake Pen. The dispenser is large enough for 3 cups of pancake batter and features an easy flow silicone tip. The pancake pen has clear sides and measurement marking so it’s easy to mix the ingredients in the pen. You may easily create fun shape pancakes with the pen and you just need to relax and have a little fun with it. The pen is made of long lasting contoured plastic and has a cozy and sturdy grip. The tip is heat-resistant up to 600 degrees and the pen is easy to control. Let’s not forget about the top and bottom that are easy to remove for filling and cleaning. As for the last part, the pancake pen is dishwasher safe so the cleaning runs easy. There’s only one thing we don’t like about cherries: pit them. 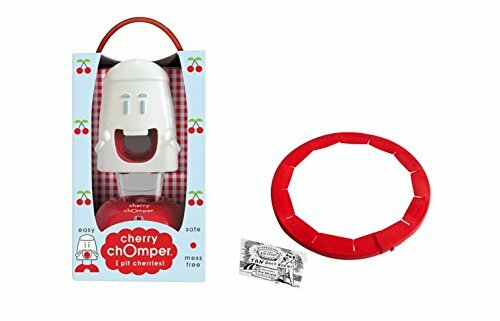 The drama is over though with the Talisman Designs, Cherry Chomper Cherry Pitter is a fun and cute way to pit cherries so you get to really enjoy them every time. The cute gadget pit cherries as it pushes cherry pit and residual juice into a container, placed on the bottom of the pitter. So no more messy surfaces when pitting the cherries. You may use the gadget for cherries and olives, for faster and easier jobs. The gadget features also an adjustable pie shield and you may adjust it to any size pie from 8 to 11.5 in, including the rimmed dishes. You may use safely the Pie Shield in the oven as it’s safe up to 500 degrees. It’s easier and faster to use the shield than the tin foil. The piecrust isn’t going to burn anymore so you get a nice, tasty pie every single time. The Cherry Chomper is a great gadget to have in the kitchen as it helps pit and bake some cherry pies, without the mess! 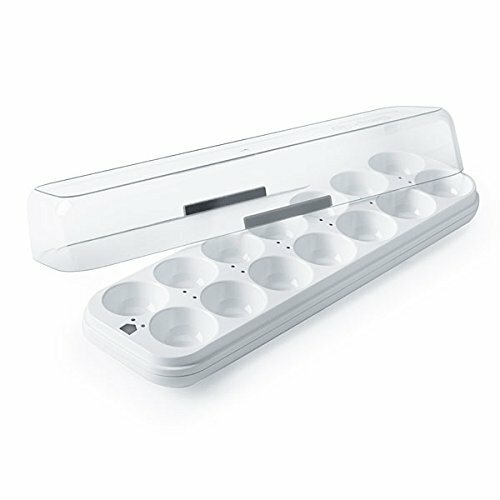 For the electronic gadget lovers, an interesting and fun this Christmas would be the Egg Minder Enabled Smart Egg Tray Refrigerator Quirky & GE Kitchen Gadget App OS. The Egg minder includes one tray and lid and needs 2 AA batteries. You may connect it to the Wink app over Wi-Fi. It works iOS6 and above, Android phones/tablets with OS2.2 or higher and iPhone4 and above. The gadget syncs with your smartphone, telling you how many eggs you’ve got home (up to 14). It also informs you when they go bad. As you may easily connect it with your smartphone, it saves you from some worries, giving you more time to concentrate on the real problems. The in-tray LED lights show you the oldest egg, giving notifications alert if you’re running low. You may easily check the Egg Minder when you’re out shopping for grocery so you don’t need to have too many eggs in your fridge. The gadget is made with plastic and acrylic and has a Wi-Fi chip and LED lights. Interesting, fun to use and a real useful gadget for the gadget lovers out there, the Egg Minder is definitely going to bring a smile this Christmas. Make a pet lover happy this Christmas with the PetSafe Drinkwell Platinum Pet Fountain. 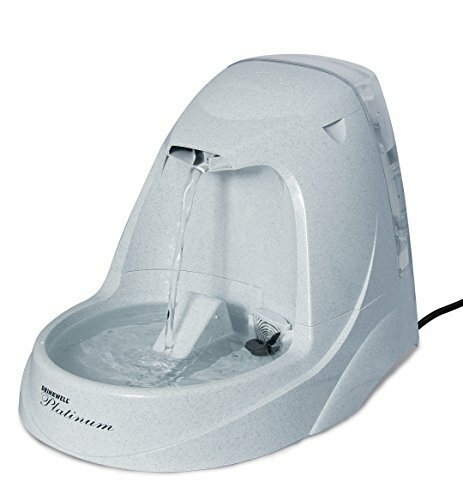 The pet fountain has 168-ounce water capacity and is large enough to hydrate pets of all sizes. The free-falling water stream is fun for the pets, making them drink even more water. The fountain comes with a carbon water filter that is replaceable, eliminating bad testes and odors and giving your pets a fresh water anytime. Your pets don’t get kidney and urinary diseases anymore as they are constantly hydrated. The constant circulation inhibits bacteria growth, so the pets remain healthy. The pre-filter catches hair and other large particles before they get to the pump, therefore extending the durability of the pump. The built-in reservoir is big so you don’t need to fill it very often. Anyway, if the motor is making a humming noise, it’s time to fill in the reservoir. The Snap-On lid lets you easy replace the filter, whereas the receiving ramp minimizes splash and sound of the falling water. The list of features doesn’t stop here and we also notice the rubber feet on bottom that keep the fountain in place, without moving or sliding. The gadget is easy and safe to use thanks to its 12V system with inline-plug connection. The fountain is made with BPA free plastic and it’s easy to clean in the dishwasher, on the top-shelf. It’s easy to disassemble it for cleaning, just that you know. 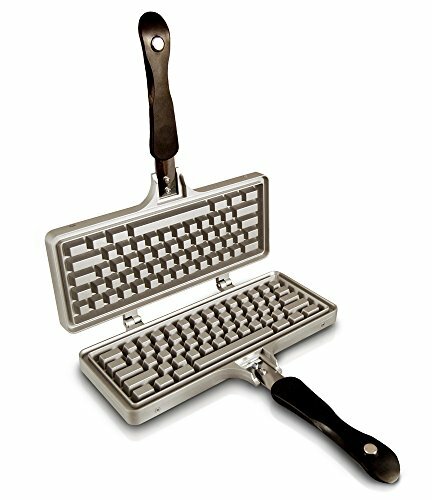 For anyone loving waffles and their computer just as well, The Keyboard Waffle Iron is a great way to combine them both. The Keyboard Waffle Iron features a wide format plate that gives tasty Belgian-style waffles in the shape of your computer’s keyboard. It features a curved handle that is comfortable and easy to flip. The handles are lightweight and heat-resistant, so it’s easy to flip and cook your favorite desert. The waffle iron has a simple and sleek profile that looks good in any kitchen. The gadget presents a die-cast aluminum design that doesn’t stick and it’s very easy to clean. The waffle iron is long lasting and tough, taking the intense use. The waffle iron heats up fast and cooks evenly your waffles. It’s easy to move around and very easy to display/store. If someone you love has always been dumping you for the long trips, as they couldn’t feed their cats, put your trust and faith in the modern gadget GemPet Petwant SmartFeeder. The gadget helps any pet owner feed their pets while they’re away. Anyone can set time to feed his or her pet automatically or go with the manual feeding from the mobile device. You may use your smartphone to control the feeder, no matter how far you are, any time you want. You may also control the amount of food served at each mealtime from your smartphone. The SmartFeeder software is downloadable free and it’s compatible with Android, Apple, iOS and tablets as well. 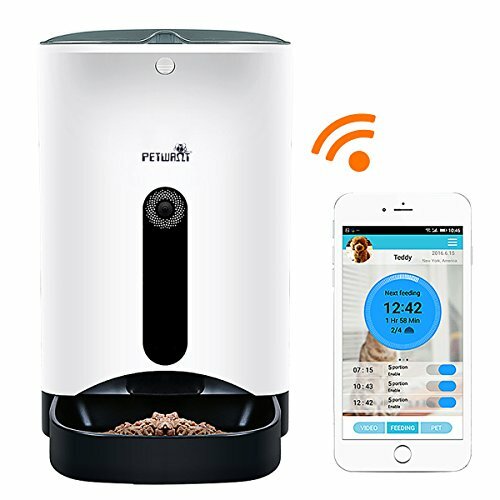 If the SmartFeeder is offline or it doesn’t connect to Wi-Fi, it goes automatically into the Offline Feeding Mode, distributing food just the way you set it to. The feeder may only connect to 2 point 4 GHz WI-Fi network and you need to go through the instructions if you’re moving to a new Wi-Fi. The gadget isn’t just about food, but it also helps you watch your pet thanks to its 1000000-pixel camera in the front. The camera is recording the moves of your pet so you may easily watch it. As for the cleaning, no worries. The feeding bowl and the food storage container are easy to collapse for cleaning so your pet remains cute and healthy. Modern, useful and reliable, the gadget is going to make any pet lover incredibly happy.